[CONT](VC):If the number of cards in your soul is fifteen or more, this unit gets "[CONT](VC):All of your guardians get [Shield]+10000." and "[AUTO](VC):At the end of the battle that this unit was attacked, Soul Blast (2).". [AUTO]:When this unit is placed on (VC), choose one of your rear-guards, search your deck for up to three cards with the same card name as that unit, put them into your soul, and shuffle your deck. And then I ran out of ideas and decided to just include a card that no-one with a passing interest would reasonably defend. Sullivan needs 15 soul or more, but if he has that much, all your guardians gain 10k shield, but he loses 2 soul every time he's attacked. Oh, and like Reijy, when ridden, he moves all the copies of one of your rear-guards from the deck to the soul. Not sustainable without Tibold, and honestly I'd rather dedicate my deck to an end result that's repeatable as well as deadly. Like, oh I dunno, Gilles de Rais. 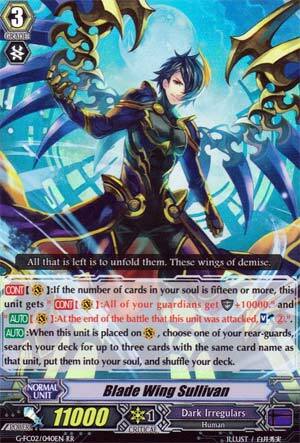 Well, this reminds me of another Blade Wing unit that Dark Irregulars have. Something, something Reiji or something. *Ahem* Anyway, like the previous one, when you ride it, choose a rear guard and get up to three copies from the deck and put into the soul and when you have 15+ units in the soul, you get a skill. Where Reiji was to get +2 critical, Sullivan here gets more defensive. Sadly, the defense isn't permanent as every time that you defend you need to SB2. Thankfully that only lasts until you're under 15 units in the Soul. Sadly that means to make him work, you need to keep filling your soul up to replace the lost units. Powerful defensive unit held back by the lack of units to keep filling the soul up. But I suppose it was needed, because otherwise it would be too hard to punch through as two crit triggers would supply 40000 shield with this skill. Over-all, really decent, not enough defensive options for the game sometimes.